Three bedroon, two bathroom cottage nestled away among fruit trees. With a large deck overlooking Whangapoua Harbour. This is a self contained stand alone cottage. With a washing machine, bbq, stove, microwave. Good sized house with an open layout, kitchen and lounge open up onto the deck. Two queen size beds and two single beds. Less than a 5 min drive to the beautiful Whangapoua Beach and Cathedral Cove. Lovely clean house. Bigger than we thought it’ll be. Nice quiet little hideaway. Perfect for that end of year retreat. We loved staying here, excellent spot for the kids to run around. Plenty of space and great rooms. Thanks for the stay. New bathrooms, separate dining area, much bigger house than the photos. New bathrooms, separate dining area, much bigger house than the photos. 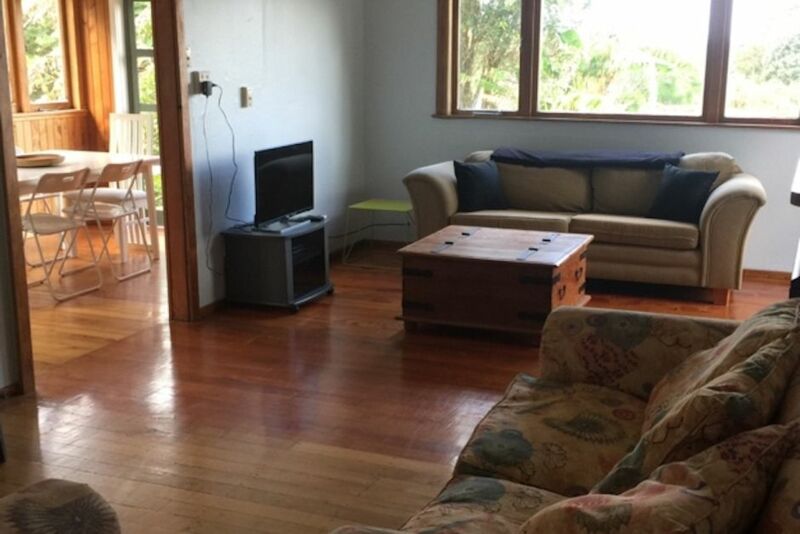 Great location for fishing, snorkeling and easy access to East and West of Coromandel. Highly recommend. Great location, very clean, quaint cottage. Great location, very clean, quaint cottage. Appreciated the milk in the fridge. The only concern we had was the cracked window.